My wife dropped me off at the train station just in time to pop into the first class lounge and pick up a banana and a couple of flapjacks for lunch. 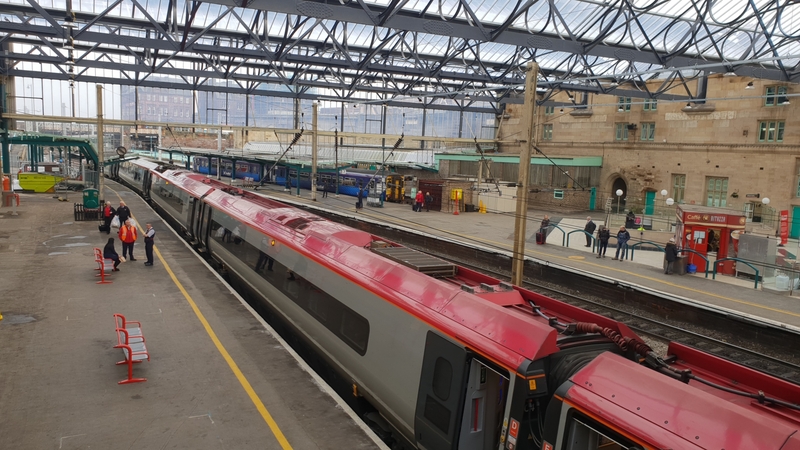 The train was almost completely empty when I joined it at Crewe, and only a couple more people joined the carriage as it sped north through Wigan, Preston, Lancaster and Oxenholme before finally depositing me at Carlisle at 09:00, right on time. I’d arranged for a taxi to collect me from the station and drive me to the start of the walk at Rockcliffe, since there’s no bus service out there. Tina the Taxi was right on time too and she chatted about walking in China and Malta once she learned I was walking the Eden Way. I got out at the church in Rockcliffe waved her off and pulled on my pack – for the first time in well over 6 months! I hadn’t really done a lot of preparation for this walk, other than losing about 12kg of excess baggage since Christmas, and I must admit I was a little nervous about how well I’d cope. To add to the nervousness, I’d decided to use my boots for the walk, rather than my trail shoes which I used almost exclusively last year. Rockcliffe isn’t the start of the walk, it’s just the closest point I could get a taxi to, so I had about 2 miles of walking to reach the start proper, out in the salt marshes of the Solway. It was surprisingly busy with dog walkers and horse riders and I said hello to several people before I decided I’d got as far as I needed. 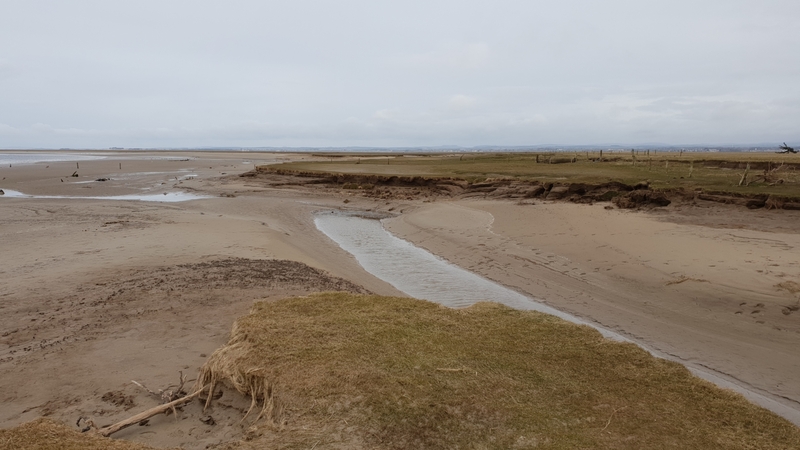 There’s no real start point out in the marsh, but I walked until the RoW ended and decided that was good enough, then turned round and retraced my steps, along the sandy beach beside the Eden, back to Rockcliffe. I found the first of the Eden Benchmarks – a series of sculptures placed close to the river, all along its length. There are 10 in total and although I can’t visit them all (some are on the wrong side of the river) I’m going to find as many as possible. The path was right beside the large sandstone sculpture and I headed out beside the river in a chilling wind and heavily overcast skies – I was convinced it would start tipping it down any moment. The walking was lovely and the paths were remarkably dry considering the recent snow they’ve had, and it was great to be so close to the river for so much of the walk. This did show up quite a lot of flood damage, to fences and trees and lots of places where the bank has been eroded. I met very few people, other than a couple of dog walkers which is not surprising really, as once you leave Rockcliffe there’s not really any villages near enough for people to walk from. My feet began to protest at the boots they were confined in and I stopped and readjusted, but to little effect – they were just going to have to get on with it and sort themselves out. I found a picnic bench at almost exactly midday, which I interpreted as a sign and stopped to eat my purloined supplies. I was surprised to meet another dog walker, a long way from anywhere, following the river in the opposite direction from me. We swapped a few words and he left. A little further along the path, after I’d finished lunch I missed a path junction. I continued right beside the river, as I had been for the past several miles, until, about a mile later I found the way blocked by two barbed wire fences. I cursed profusely and scrambled up the bank into the field to find the path I should have been on, so close that on the GPS it had looked like I was on the right path. Under normal circumstances I would have just carried on, but I’m writing a guide book for this route and I couldn’t bring people this way. So I had to backtrack to find where I’d gone wrong, so I could pick up the notes in the right place! That little navigational balls up cost me about 2 miles, I was a bit grumpy for a while! The path continued to be excellent and the river was wide and slow and constantly on my right. I chatted with an angler for a few minutes, he was trying to catch Salmon, heading up the river to spawn but had had no luck. I was silently pleased. 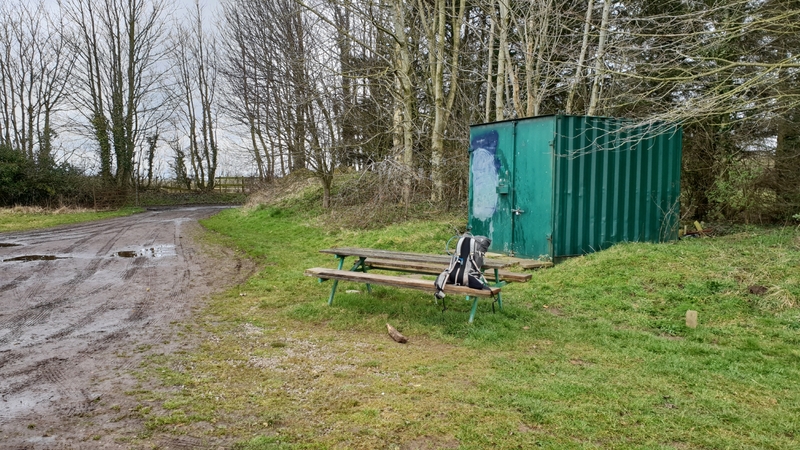 The sun came out for a while and it became almost warm, so I stopped again for a while, finishing the last of my lunch items, until the sun went in and it began to rain, just enough for me to don the Paramo jacket and move off again. Within 2 minutes it had stopped and the sun came out again! The last few miles were broken by a short stretch on tarmac through Etterby, before dropping back to the river and the final stretch into Carlisle. I found the second Eden Benchmark, a series of four stones, each one showing a different stage in the sculpting of balls from cubes. Which looks better than it sounds. I entered the city via the castle and found a pub to celebrate the end of the first day. They had no beers that took my fancy and I was going to move on but I noticed it had started raining, so stayed put and drank Diet Coke instead. I eventually braved the drizzle, heading to McDonald’s for tea (don’t think I’ve ever been able to do that on a long distance walk before) and then on to the B&B. I’m in my room now, which provides a set of ear plugs beside the bed, which seems rather ominous and I’m unsure what to expect! There was a moment of panic when I thought the USB charger I’d brought with me was broken and I began to look at options for replacing it in the morning, but thankfully it turned out to be a power cut and all my bits are charging happily as I write this. Feet are quite sore, but I only have 10 miles or so tomorrow, so they should survive.